Artists explore the awe-inspiring drama of winter in the West on canvas. Winter in the West is a time of transcendent beauty and just plain hunkered down endurance. The great naturalit and preservationist John Muir was aware of both. "I must return to the mountains - to Yosemite. I am told that the winter storms there will not be easily borne, but I am bewitched, enchanted and tomorrow I must start for the great temple to listen to the winter songs and sermons preached and sung only there." Carl von Hassler painted Sundown in Winter higher in the mountains where the snow is deeper and tends to get packed down rather than melt into mud. The snug, thick-walled adobe buildings line the road with packed snow. 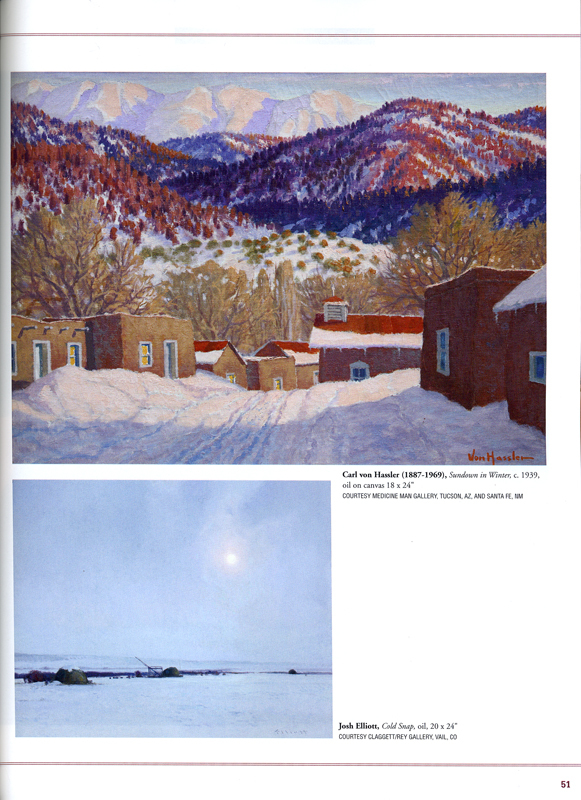 Von Hassler was born in Germany and moved to Albuquerque in the 1920s. He studied the plants, people, and environment of his new home so he could capture the essence of it all on canvas. Sundown in Winter is a study in light and dark that leads the viewer through the space into the far distance and is painted with a limited palette. Santa Fe Editor John O'Hern, who has retired after 30 year in the museum business, specifically as the Executive Director and Curator of the Arnot Art Museum, Elmira, N.Y., is the originator of the internationally acclaimed Re-presenting Representation exhibitions, which promote realism in its many guises. John was chair of the Artists Panel of the New York State Council on the Arts. He writes for gallery publications around the world, including regular monthly features on Art Market Insights in American Art Collector magazine. Having succumbed to the lure of the West, he now lives in what he refers to as a "converted adobe goat shed," in the high desert of New Mexico, where is acquainting himself with new flora and fauna.